A booming economy has Sea-Tac Airport trying to keep up and some neighbors are worrying about the impact. This article appears in print in the September 2018 issue. Click here for a free subscription. The booming Seattle economy has generated some unwelcome side effects. A lot of traffic and not a lot of affordable housing have risen to the top of many gripe lists. So has getting to and from Seattle-Tacoma International Airport, which is experiencing an unprecedented surge in the number of passengers boarding and disembarking. Last year, 47 million people went through Sea-Tac. If estimates by the Port of Seattle prove correct, the airport will exceed that total this year, marking the seventh consecutive year of growth in passenger arrivals and departures. 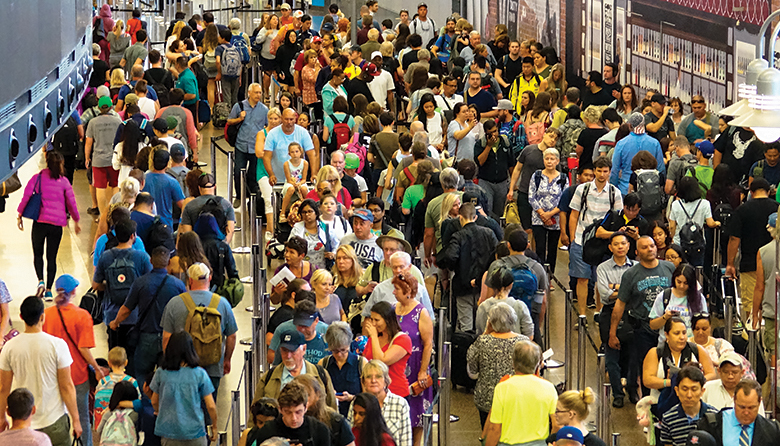 By 2034, studies project the annual total of passengers transiting Sea-Tac will reach 66 million. The port understands that connection. “We are investing about $3 billion in capital development projects between now and 2022 to improve the customer experience as well as to reduce delays that people experience,” says Gregoire. Incredibly, Sea-Tac has nearly 100 projects going on at the moment. The big three involve construction of a new international arrivals facility, extensive renovation of the central terminal dining area and renovation of the north satellite terminal. An improved ability to handle international arrivals and departures is sorely needed. The airport routes international travelers through the south satellite, designed to accommodate 1,200 passengers an hour but now way over capacity at nearly 2,000 an hour. The international arrivals facility, scheduled to be finished early in 2020, will increase that capacity to 2,600 passengers an hour. The 450,000-square-foot multilevel facility for international arrivals will connect to the existing main terminal building via an 85-foot high, 900-foot-long aerial walkway — more than a sixth of a mile. It will increase the number of gates for international flights from 12 to 20, the number of passport-check kiosks from 30 to 80, and the number of bag-claim carousels from four to seven. Renovation of the central terminal involves adding a second level of shops and restaurants, including Floret by Café Flora, a spinoff of the popular vegetarian restaurant in Madison Valley. In all, Sea-Tac will add about 50 new food and retail spaces during the next five years. Renovation of the 45-year-old north satellite terminal, targeted for completion in 2021, will add 180,000 square feet and eight new gates, bringing the total to 20. Space for eating and shopping will double. The work also includes seismic upgrades. The good news for taxpayers is that all this expansion is being paid for by the port. “We are reinvesting revenue that is generated at our airport,” says Gregoire. The not-so-good news, of course, is that revenue generated at Sea-Tac ultimately comes from, well, anyone who flies to and from Sea-Tac, which includes a lot of Washingtonians. And some are questioning the wisdom of the expansion, especially in light of recently announced cost overruns for the work on the international arrivals facility. The original estimated cost in 2015 was $608 million. In April, the port revised the total to $830 million and noted the project was five months behind schedule. One cause of both the delay and the higher costs, says Lance Lyttle, managing director of the aviation division at the port, was the discovery of PCBs in the ground beneath an old structure in 2017. “Of course, we had to excavate and move that,” Lyttle says. “That was unexpected.” It also cost $4 million and caused at least a three-month delay. Apart from costs, many of Sea-Tac’s closest neighbors worry about the effects of more air traffic, primarily noise and pollution. “While there is no doubt that Sea-Tac Airport as a regional entity is of value to the state and to the Northwest, we are the ones taking the brunt of the impacts,” says Michael Matthias, city manager of Des Moines. Yarden Weidenfeld, senior policy adviser to the mayor of Federal Way, agrees. “Mayor [Jim] Farrell recognizes that his constituents are bearing more of the costs of air traffic whereas people in North King County get all the benefit and none of the cost at all,” he says. What has Matthias and Weidenfeld most concerned are the unknown impacts of ultrafine particle pollution from jet exhaust. A 2014 study by scientists at the University of Southern California and the University of Washington found that minute particles resulting from the condensation of aircraft exhaust vapor — which is not currently regulated — can penetrate the lungs, enter the bloodstream and eventually reach the brain, heart and other critical organs. What’s more, the study found that particles may spread up to 10 miles from the airport. The state Legislature has funded a new study on the impacts of ultrafine particles. This research, conducted by scientists at the University of Washington, is expected to be completed by December 2019. Matthias and Weidenfeld support the idea of siting an additional regional airport somewhere less crowded to handle much of the cargo traffic. The Puget Sound Regional Council, which coordinates regional infrastructure planning, is launching a study of the regional air transportation system. But Rick Olson, the council’s director of government relations and communications, says there has been no discussion of creating a second regional airport.